For woodworkers and DIYers, routers are inarguably one of the most valuable tools they mustn’t lack in their toolboxes. But then again, what is a router without a router bit? Possibly useless. It is like a hammer without a handle. With the vast variety on the market, selecting the right bit for your router can be a daunting task. If this is your first time buying a router bit or you are just disappointed with what you have and want better bits, then you are at the right place. We will help you understand the best way to choose router bits and even provide you with informative reviews on some of the best bits in the market with features that differentiate each one of them. So read on. First, you should know that the best bits are the ones that get the job done and satisfactorily too.They come in different shapes, sizes and materials. The prices of the sets vary depending on the quality of each item. Therefore you will find that the cheapest bits are the ones made with mid range quality materials that tend to dull faster. On the other, carbide tipped bits are most preferred for a variety of applications although they are quite expensivein the market. 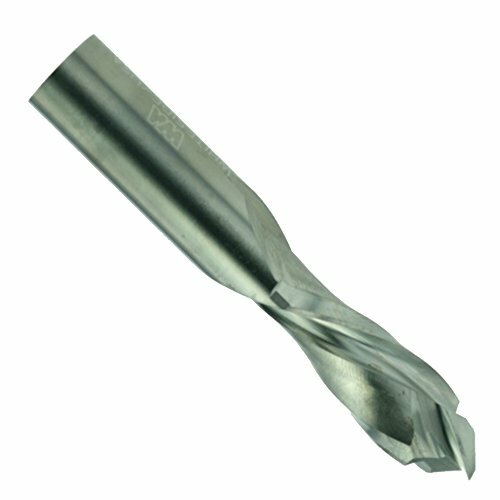 So if you want bits that can maintain sharpness for longer and can also work well with hardwoods or any other hard materials, then carbide tipped bits are the best choice. Ideally, they are the best bits for the money. For the sizes, there is quite a variety. Most router bits come with ¼ and ½ inch size shanks, and the latter is best preferred as they tend to produce less noise and chatter. Well, this might not sound important to some, but the right router bit is not just meant to improve the quality of your work but also provide you with maximum safety when using it. Noise can damage your eardrums while vibration can lead to accidents. You also need to know the type of bits you will be buying. There are various kinds in the market with each type meant for different applications. The two main categories are the basic router bits which every woodworker should own and the decorative molding bits that are specially designed for decorative purposes. So ensure that as you choose your bits, you are well informed of your needs and what features you want in an ideal router bit. Like earlier mentioned, there are different kinds of routers for various applications. Reading up our brief description of the following common types will help you to choose the best bits and make the most out of them. These are the most commonly used and are used to make cuts straight down into materials. Straight router bits cut out grooves, dadoes, and mortises for constructions. As the name suggests, rabbeting bits are used to cut rabbets in the edges of materials; these are the straighter vertical and horizontals types of cuts. Rabbeting router bits have a pilot bearing that guide the set along the edge of materials. This type is also guided by a pilot bearing that is usually of equal size as the cutting radius of the bit. Flush trim bits are used to trim the edge of one material flush with the edge of another material. This is an excellent example of a decorative molding bit type, and it is used to produce precisely angled bevel cuts. Chamfer bits are commonly used to decorate the edges of materials and also to cut joints for multi-sided constructions. Round over bits for cutting rounded edges of specific radius. Ogee bits which are S-shaped. Most of the edge forming router bits have a pilot bearing and in most cases are used to make final decorations on materials with already formed edges. These are quite large than the edge bit, and some tend to incorporate multiple edge-forming profiles into a single bit. Due to their large design, molding bits are best used with router tables for safety reasons. With this type of bit, you can comfortably make several decorative profiles thanks to the combination of many bits in one. For frame and panel construction, this is the best type of bits. With this bits, you can cut decorative profiles and panel slots into the edges of frame material and also cut a corresponding slot on the edge of the rail where it meets the stile. Raised panel bits are commonly used together with the ‘stile and rail” bits to produce a profiled edge on a door panel and are available in both the horizontal and vertical configurations. However the former can be used to cut panel profiles with the material lying flat, and the latter will cut panel profiles with the materials tipped up on its edge and run along a fence. Vertical raised bit are better choices for safety due to their smaller sized radius. But in the case where you need to cut panels with curved edges then a horizontal configuration is preferable. Joinery bits are used to provide precision oriented joints. They include dovetails, finger joints, and lock miter bits. However,the dovetail bit is mostly used together with a dovetail jig for better results. Well, it’s a Freud, one of the bestselling tool brands in the market currently. Forget the name, what about the quality and functionality? These are top notch just like the brand, the quality and performance offered by this Freud bits is just awesome. What’s more is that they are designed and engineered for precision and maximum durability, what more could you ask for in a router bit? Being a Freud, the first notable feature is the carbide material used. The brand wastes no time in bragging about their exceedingly amazing innovations and processes used in making their cutting tools, and that is the exact case with this particular bits. TiCoHi-density Carbide cuts and Perma-SHIELD coating is some of the things you get to love this bit. In simple terms, you will experience top quality and long lasting cutting with this (50-102) flush trim bits. Apart from the design and construction, versatility is another thing you get to like about this bits. Its quality is not just for bragging but is significant as the tool is evidently sturdy enough to cut through a variety of materials like composite materials, hardwood, plywood and other softwood workpieces. The bit is computer balanced, do you know? So as to ensure that your operations remain steady and stable throughout. The vibration-free operation provides maximum safety when working as well as allows you to trim perfectly. With all its features, this bit is a total package for use in lettering and template work. It also has ball bearings that make it an idealbit for creating grooves and sorting out materials. Although this bit comes with so much praise, it has flaws with the bearings which are quite large than the cutting diameter provided for the bit. With the support of the various positive reviews, this bit has received, I must say that it is in one word excellent. Do not hesitate to put your money into this flush trimming bit by Freud; it is the best bit for the money. Beginners sure love this bit set. Judging from the various user reviews, this set seems to deliver up to the expectations of most woodworkers getting started with using routers and routers bits. So if you are a beginner and are on a tight budget there is no better set I can recommend than this MLCS 8377 set. It is not just good looking as many, say but it is also an economical piece that provides you with a variety of routing options to choose from. This bits might not match up to the Freud model above, but its quality and pricing is good enough to get you started on your woodworking and routing journey. Like I advised earlier, carbide tipped bits are the best and this set contains 15 carbide tipped bits all for you. This I must admit is awesome quality at a throw away price. For the fact that you get 15 bits in one, this set don’t give you room to think. You were budget concise you’ve got economical. About $40 or 15 bits is more than a bargain considering how much you would spend if you were to buy each bit separately. The ½ inch shank allow you to cut smoothly and quickly as well as give you better stability when routing. Moreover, the 15 optional bits will introduce you to a variety of routing choices like straight cutting, rabbeting, cutting dadoes and much more. Besides, the set comes enclosed in a beautifully designed wooden box that you can easily carry to and from sites. The best part is that the box allows you to neatly organize your tools to avoid losing them. The ¼ bits in the set aren’t of good quality. Work well with non-hardwood materials which is quite limiting. This MLCS bit set is the best versatile router bit set for the money. You won’t get another like this one with its features, 15 bits and all at the price it goes for. Most woodworkers especially beginners prefer low-cost bits as opposed to professionals who would rather spend more to get better quality and performance. However, since expensive doesn’t always mean quality you can opt for an excellent low cost and beginners bit set which is this Yonico 14522 straight/dado router bit. 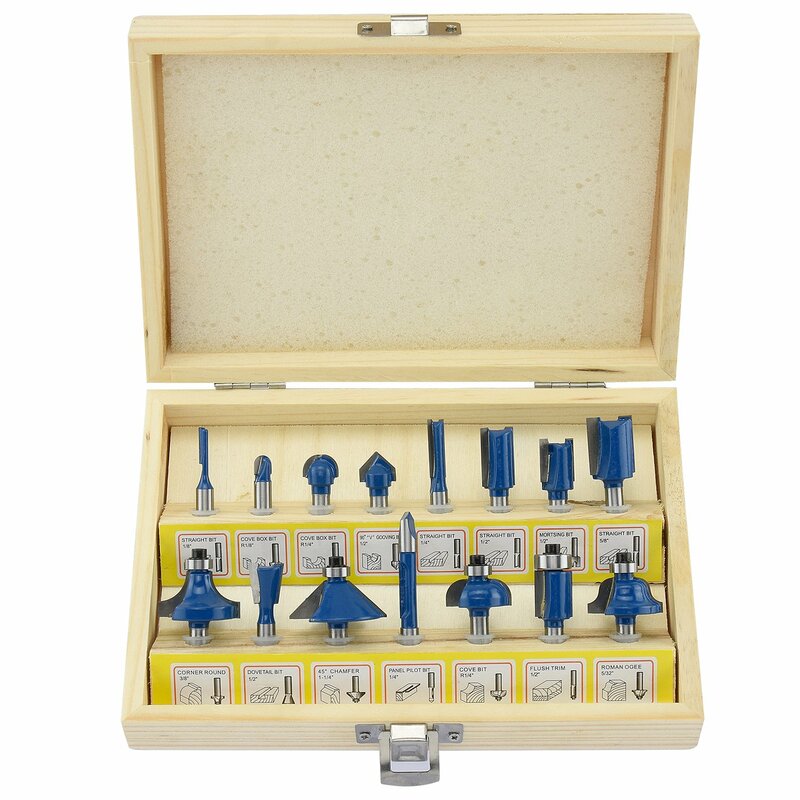 With the 5 bit options, this set will solve most of your straight and dado cutting needs at an unimaginable price. What’s more is that the set comes with a satisfaction guarantee and lifetime warranty. Yes it is a bargain router bit set, but so what, it works better than most of the expensive brands you will find in the market. Built with industrial quality and ½ inch shank, this set will provide you with a reliable and convenient cutting experience, one that is more than its monetary value. 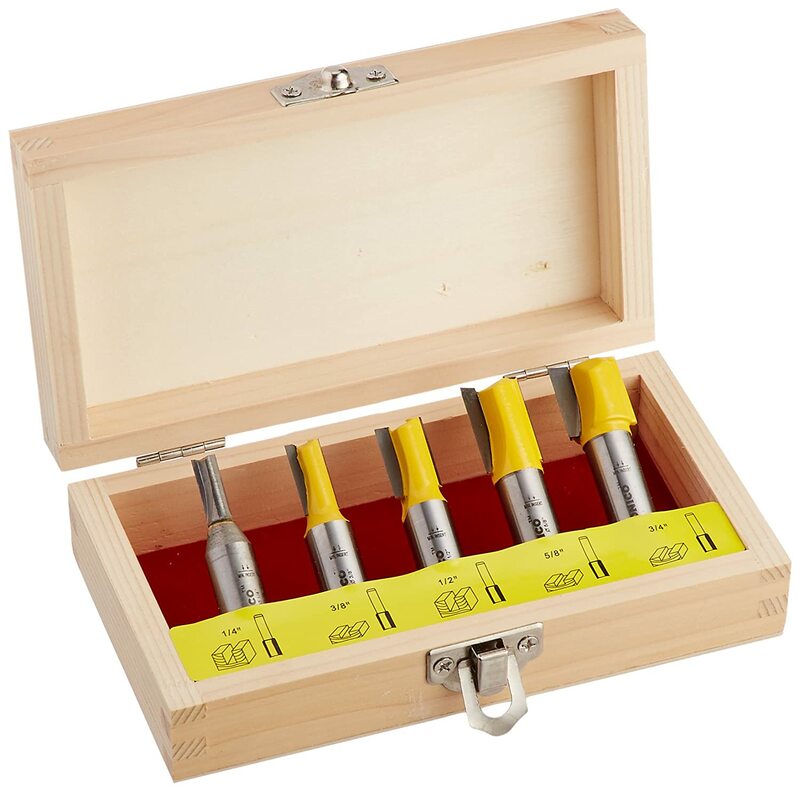 The C3 micro grain tungsten carbide ensures that you enjoy a reliable and dependable cutting time with this set; the most important aspects of woodworking. The set is also equipped with Teflon coating to prevent build ups and/or burning of wood when cutting. With solid hardened steel bodies and anti-kick back technology, working with bits assures you of maximum safety against accidents and injuries common with most router bits. The best part is that despite being bargain bits, they are quite sturdy and will retain their edge even after constant use.Something that is not common with bits in this price range. This is the best low-cost router bit in the market. In as much as you can get better quality bits for twice or thrice the price, this one still gets the job done plus offer you guaranteed quality, reliability, and safety. Whiteside has been in this industry for quite some time. The brand is established, and I must say its bits too. For those looking for the best spiral router bits for the money, this UD2102will give you the experience you need to become a pro at using router bits for your projects. The customer service at Whiteside is excellent plus the warranty offered for thebits is quite reasonable. The durability of this bits is the most catching. Made in the USA and with premium carbide, any user will appreciate the consistency and insistence of this bits even when subjected to constant harsh use. What is even better is that the bit is precision ground with the proper balance to withstand operation at high RPM. Although ¼ inch bits might not the best versatile bits for more advanced users, it is still functional and will allow you cut materials at a fast speed and leave you with pretty clean surfaces. The bits is quite basic to be used for professional work. 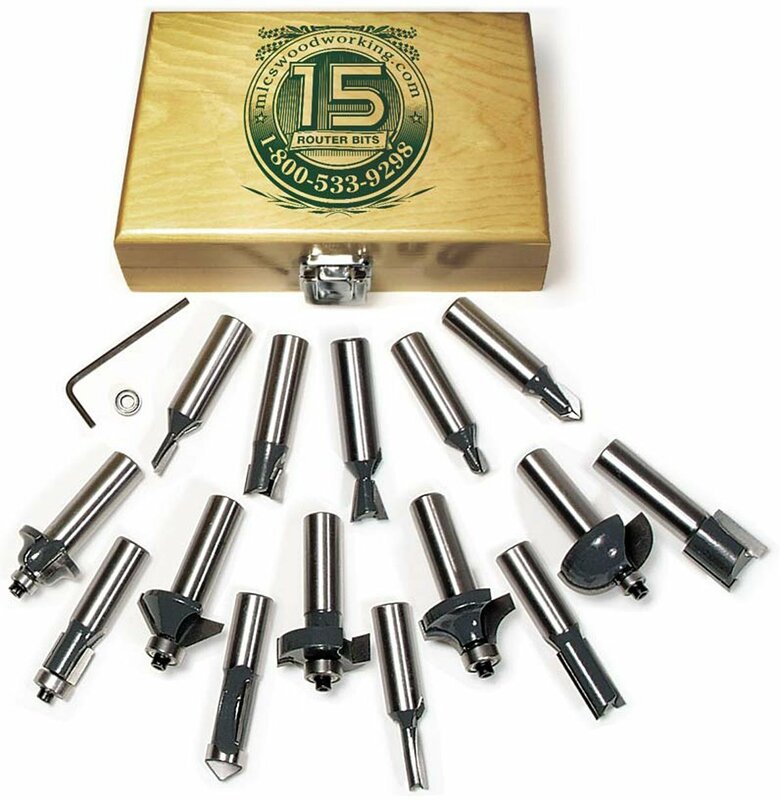 Most woodworkers love and recommend this Whiteside router bits because they provide what every DIYer and craftsman’s needs in a bit; fast and clean cutting, does not burn wood and most of all works perfectly with a variety of woods. This Hiltex set is actually a good set for thin profiling. It includes 15 bits that will enable you to get the most of edging, trimming, veining and grooving on a variety of wood materials. The bits features ¼ universal shanks that fit all router sizes. This set features 15 YG8 tungsten carbide tipped bits that are designed to allow you make clean and accurate cuts on a variety of wood types i.e. hardwood, softwood, plywood etc. Moreover, the blades are equipped with heat resistance therefore you don’t have to worry about them burning your materials. To enhance durability and to make the bits sturdy enough for the job, Hiltex manufactured them with hardened solid alloy steel for the main construction to give them long-term longevity and also a power coating finish for rust prevention. The endorsed bearing roller provides for smooth and aligned operations with the bits while the wooden casing is meant to help you organize and store your bits better. The ¼ inch shank sizes limit users to working on smaller projects. 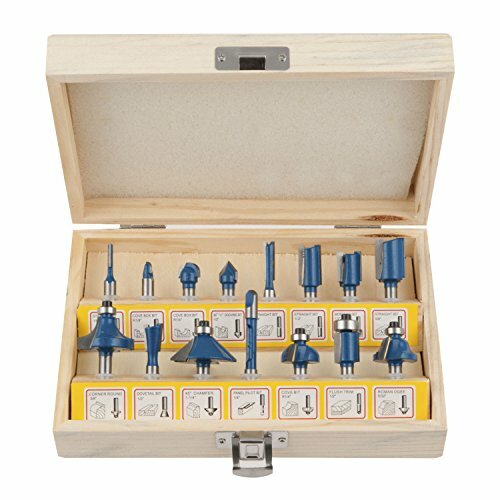 ​These might not be the best quality bits, but they are a great starters set that will give you versatility at an affordable price. For router bits, the brand and design doesn’t really matter. Of importance is that you ultimately choose the best bits that will perfectly match your woodworking needs. Be sure to conduct proper research as well as examine our suggestions above to be able to able to acquire the very best of this bits.